Trees - Structure and Function publishes original articles on the physiology, biochemistry, functional anatomy, structure and ecology of trees and other woody plants. Also presented are articles concerned with pathology and technological problems, when they contribute to the basic understanding of structure and function of trees. In addition to original articles and short communications, the journal publishes reviews on selected topics concerning the structure and function of trees. 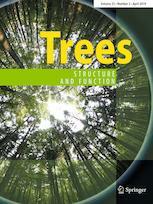 Trees - Structure and Function is keen to publish reviews and commentaries on themes related to the scope of the journal. Before submitting a manuscript, please contact the Reviews Editor Marcos Buckeridge (msbuck@usp.br) sending a short summary of the idea. The Editors-in-Chief of Trees - Structure and Function may pick selected articles and allocate them to particular topics (like tree rings, drought stress, mycorrhiza, etc.). These tagged articles will be brought together on SpringerLink in topical collections, easily accessible online as a service for our readers. Articles of such online collections will be processed and published in regular issues just like all other articles.